Are online nursing programs right for you? Do you have a sincere desire to help others? Does the thought of saving a life appeal to you? Are you the first person to rush to help when there is an injury? Then you should be thinking about a career in nursing. Few careers offer the same rewards as being a nurse, and nursing is regarded as being one of the oldest and most respected professions. Nurses work in medical centers, hospitals, doctor’s offices, long- term care facilities, clinics and more. Nurses are an essential part of the healthcare field, and they are vital to patient care and recovery. The demand for nurses is still rising as there are not enough qualified new graduates. With an ever-increasing aging population, and many current nurses set to retire over the next decade, the demand for highly trained, professional nurses will only increase. Statistics that have been released by the U.S. Bureau of Labor show that continued rapid growth is inevitable. In order to become a nurse you must receive the proper education and there are a variety of options to do so. • Certificate Program: Certificate programs are the quickest route to beginning a nursing career. 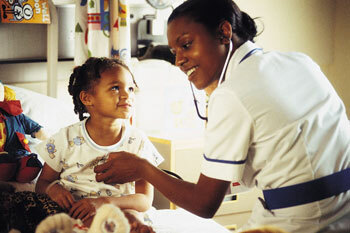 A Certified Nursing Assistant (CNA) can obtain certification in as little as 6-12 weeks. Or there is the LPN/LVN program which takes about a year to complete. Both will prepare you to take your certification exam. Certificate programs can be transferred to other degrees. Courses that you can expect to study will include basic skills and concepts in nursing, anatomy and personal care. Clinical experience will also be required, and each school will have different options available. • Degree Program: Options for degree programs are varied. They start with an Associate Degree in Nursing (ADN), which is typically a 2 year program, then there is a Bachelor of Science in Nursing (BSN), which is typically a 4 year program, and then there is a Masters of Science in Nursing (MSN) program which is usually an additional 2-3 years, after you have obtained your BSN. Higher degree options are available as well. Core subjects such as anatomy, pharmacology, biology, psychology and many others will be found in all degree programs. For higher degree goals, the courses you will study depend upon the degree itself and any specialties. Choosing from the many nursing programs is a personal choice that factors in several things such as career goals, time available and even finances. It may not be convenient for you to attend school for 2 or 4 years right away due to other obligations. If you are in a hurry to enter the workforce as a nurse, one of the certificate programs will get you started fairly quickly. Once you have started to work, you can continue your education if you choose on a part time basis that works around your job schedule. All school degree programs are not the same. Requirements vary widely amongst schools. Some have more stringent application requirements than others, and prerequisites often depend upon not only the degree, but the school that is offering it. The main thing to be certain of, no matter which nurse degree or nursing certification you choose to obtain, is that the program is properly accredited. You are only eligible to take the NCLEX exam if your education has been accredited. If you have any doubts, or are just unsure, your best course of action is to speak with your state Board of Nursing. Online courses must have the same accreditations that a regular nursing school would have in order for you to take the national exam. There will be some clinical work that must be done offline, and depending on your professor, you may have to attend the school for major exams. Most programs will allow you to log in and study on your timetable. The professor keeps virtual office hours for questions and concerns, and you often simply email in your required assignments. Again, there is much variation here between schools, degrees and the professors themselves, so it is essential that you thoroughly do your research. The curriculum will depend upon your degree or certificate choice. The higher the degree level that you are planning to obtain, the more intensive the course content will be. The practical/clinical component that is contained in the course cannot be done online, so arrangements will have to be made for this aspect. No matter which degree you plan to obtain, or how you plan to get it, you must make sure that you have fully researched your choice. This will help ensure that the nursing program has every component that you require to reach your professional goals.